Chinese twin study: simian crease passes inter- & intra-observer agreement test! Earlier this year a Chinese study revealed that the 'simian crease' has passed a test focussed on inter- and intra-observer agreement. 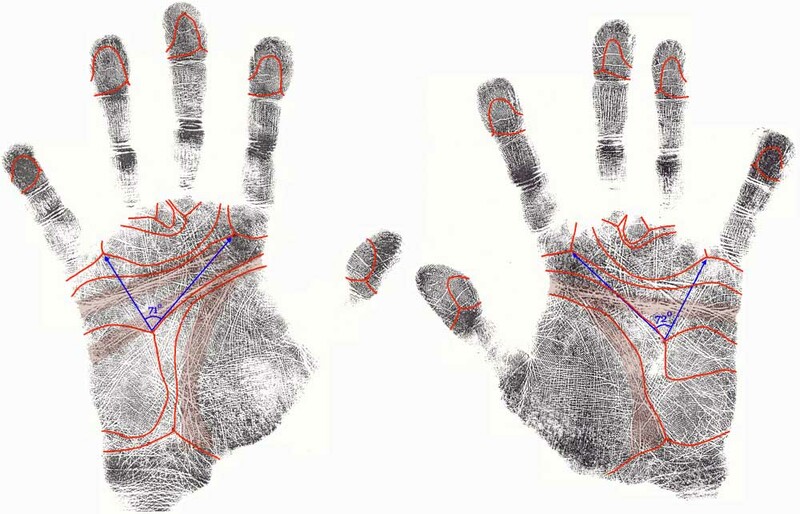 This result implicates that the 'simian crease' meets an important requirement for any application in hand diagnostics! Physical features observation: is it repeatable in zygosity determination of Chinese adult twins? Gao W, Li L, Cao W, Zhan S, Zhao Y, Wang H, Hu Y. Department of Epidemiology and Biostatistics, School of Public Health, Peking University Health Science Center, Beijing, China. This study reports on the inter- and intrarater reliability of physical features observation. Study subjects were 176 Chinese adult persons, consisting of 89 males and 87 females. 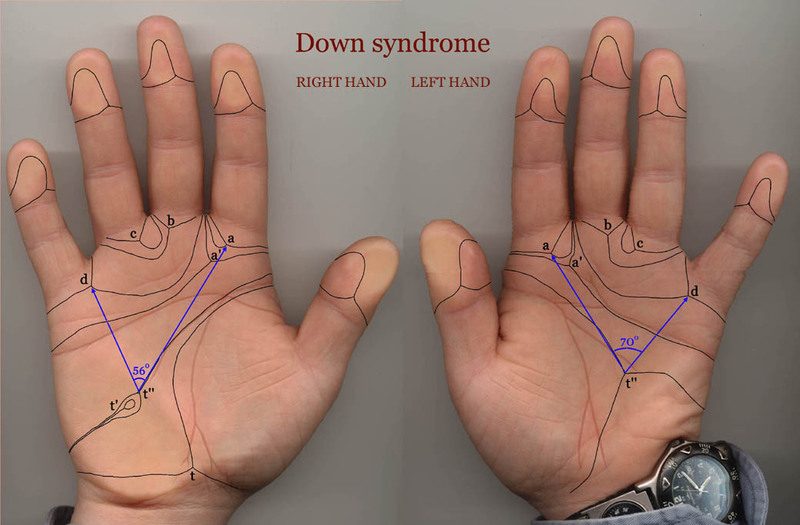 Three trained research assistants responded simultaneously and respectively to 12 items regarding the subject's physical features including 'hair', 'Mongoloid folds', left and right 'ear lobes', 'earwax', 'nostril shape', 'tongue rolling', left and right 'hitchhiker's thumb', 'mid-digital hair' and left and right 'simian crease' at the moment of interview. And 14 days later, these subjects received the same observation once again. The results showed that the inter- and intra-observer agreements of 'hair', 'earwax', 'tongue rolling', 'mid-digital hair' and 'simian crease' were almost perfect with most kappa (kappa) coefficients >or= .80, while 'Mongoloid fold' and 'nostril shape' showed poor inter-observer agreement and 'nostril shape' showed poor intra-observer agreement (kappa < .40). Two other physical features, 'hitchhiker's thumb' and 'ear lobes' showed moderate inter-observer agreement and three features, 'hitchhiker's thumb', 'ear lobes' and 'Mongoloid fold', showed moderate intra-observer agreement (.40<or= kappa <.80). In conclusion, this study suggests that as far as reliability is concerned, the five features which were 'hair', 'earwax', 'tongue rolling', 'mid-digital hair' and 'simian crease' could be considered in zygosity determination of Chinese adult twins, while the two features, 'Mongoloid fold' and 'nostril shape', should be abandoned. Re: Chinese twin study: simian crease passes inter- & intra-observer agreement test! 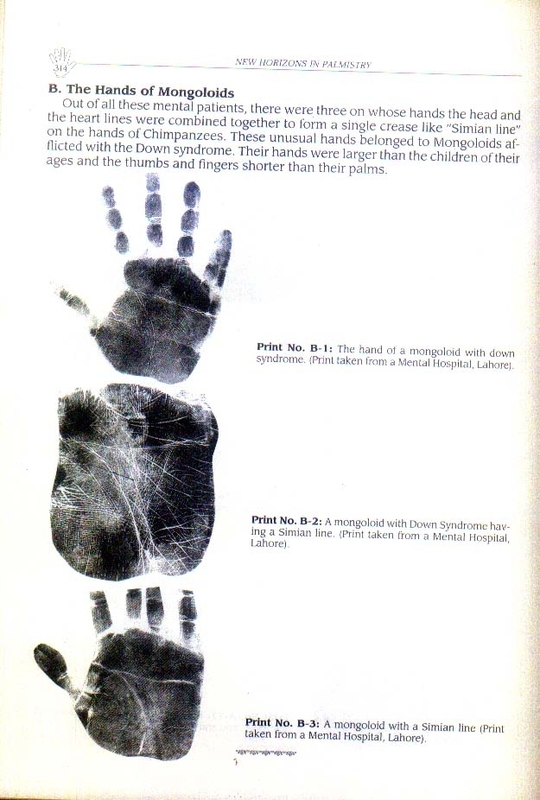 Related to this topic, I have some palm prints of Mongoloids, it is taken from M.A Malik's book " The new horizon in palmistry". Thanks for posting all that. You send a lot of great information. asif amin wrote: Related to this topic, I have some palm prints of Mongoloids, it is taken from M.A Malik's book " The new horizon in palmistry". By the way, for those who are not yet aware of the 'vocabulary'... the words mongoloid refers to people who have a genetic disorder named 'trisomy 21', which is better known as Down's syndrome.